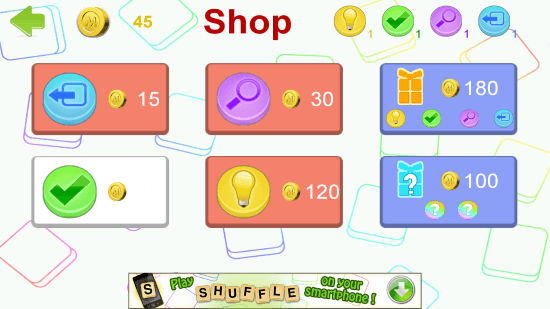 Shuffle is a word puzzle game for Windows 8 PC, and is free to install. This Windows 8 puzzle game is a very good tool to strengthen, and test your vocabulary. The game is really interesting, as it has multiple levels, and these levels get tougher as you clear them. Playing Shuffle is really easy. You get a set of 5 words, and the letters of the words are arranged randomly. All you have to do is drag and drop the letters to their correct positions to form a word. You have to do this shuffling for all 5 words. Once you complete arranging the words, the level is completed, and you will be awarded with coins. 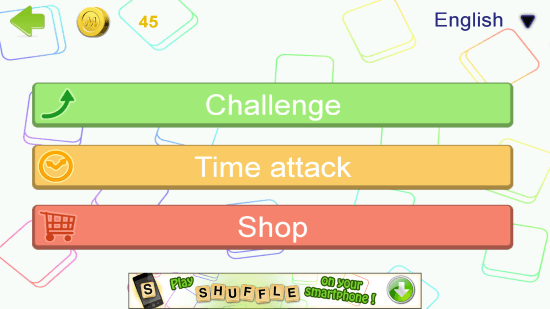 Shuffle has 2 game modes: Challenge, and Time Attack. Challenge Mode: Challenge mode has 3 different categories: Easy, Medium, and Hard. Each category has 3 levels: Easy 1, Easy 2, and Easy 3. Each of these levels have 40 sub-levels. You have to clear a sub-level to unlock the next sub-level. Once you complete all the sub-levels of Easy 1, you can play Easy 2, so on, so forth. You can also start playing directly from Medium, or Hard categories. The same rules of Easy category apply to them. Time Attack: This mode is categorized the same as challenge mode: Easy, Medium, and Hard, but there are no more further sub-divisions. When you click on a mode, the game starts. You have to arrange the words in a given amount of time. Each level lasts for 2 minutes. Solve all words on the screen. Solve the word of your choice. Highlight the first letter of the word of your choice. As you go to the higher levels, the puzzle gets tougher to solve. To help you move to other levels, these lifelines/bonus have been provided. The lifelines are limited, and they need to be topped up every once in a while. You can buy these bonuses with the help of earned coins. Go to the Shop option to buy these lifelines. Each one of them have different values. You can also buy all four bonuses at a time by paying 180 coins, which will cost you 225 coins, if bought individually. You can also checkout Word Drop Delux and Animated Puzzles for Windows 8. So what are you waiting for, download this awesome Word puzzle game today on your Windows 8 device, to put your brain on a test. This game is a perfect app for mental exercise, and it also helps with learning new words.